There’s more at the shore! When the beach and the bay are calling, answer with a splash in Dauphin Island, Fairhope, Gulf Shores and Orange Beach. 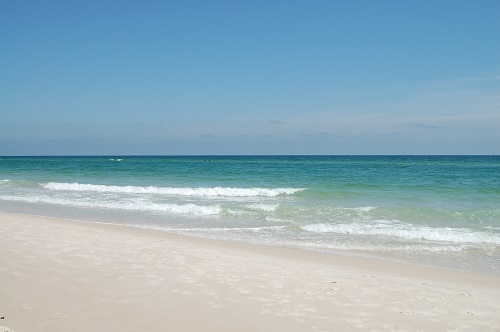 Clear waters and white sand in Gulf Shores and Orange Beach. Relax and enjoy the sun, sand and all those quintessential family beach experiences right beside one of the most renown and iconic piers in the South. The Fairhope Pier, with its impressive bed of roses and flowers surrounding a lovely fountain, is the setting for this popular pier, park and bayside beach. It’s the perfect place to relax and watch the waves and sailboats go by. Spend a day playing in the soft sand, building sand castles, collecting seashells, flying a kite, reading a book or just napping under a bright umbrella. Do whatever you wish! Our water is majestic, sparkling and warm. The temperatures are mild most of the year. And the family atmosphere is perfect for creating those quintessential beach vacation memories. And don’t miss a sunrise or sunset—they are spectacular any time of year. If a thrill is what you crave, parasail or take a helicopter ride high above the Gulf where you can see all kinds of fish, dolphins and birds. Or rent a personal watercraft and jump the waves on a Jet Ski, kayak, or hop on a “banana” super tube with friends. Don’t forget the Gulf’s largest artificial reef is right here in Orange Beach, so take the plunge and dive among thousands of manmade habitats for beautiful fish, mollusks, crustaceans and coral. Visit the secluded beaches of Dauphin Island, one of the Islands of the Gulf Coast that offers pristine white-sand beaches, blue waters and some of the best bird watching in the country in spring and fall. Away from the hustle and bustle of city life or densely-populated areas, the beaches are peaceful and ideal for relaxing. Bicycle paths, walking trails and seven miles of sandy-white beach allow you to dive deep into your surroundings. Take a dip, read a book, build sandcastles with the family, or kayak all around the island. Enjoy a sunset like none you’ve seen before with unmatched colors and views looking west.